That's right. 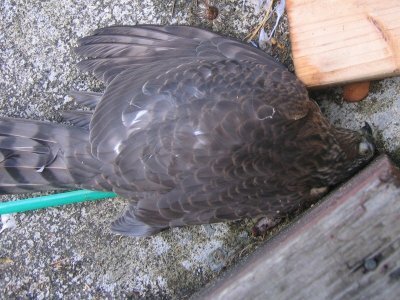 The hawk was chasing the starling and the starling didn't see the glass (just like that stupid Windex commercial with the two magpies), and the impact was enough to kill them. Poor birds. 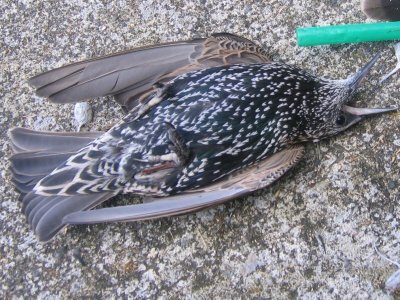 The starling didn't die on impact; it was gasping for breath, but it was clear that the bird's neck was broken, as it couldn't hold its head in place. It died about a minute later. I originally thought the starling was a woodpecker, but I was corrected in a forum where I posted the images. 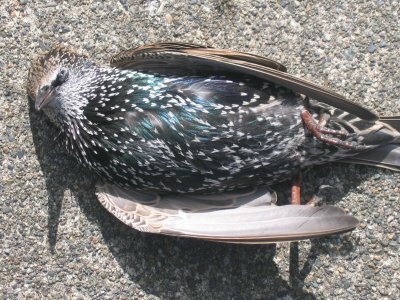 It is, in fact, a European Starling, which is apparently not native to this area (western Washington) and quite a pest. Bird lovers around here do not love that bird. 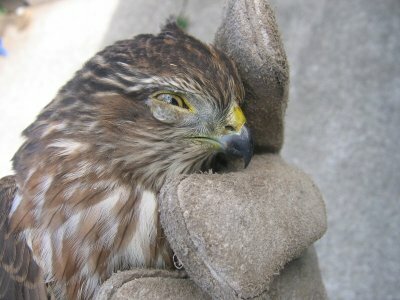 The hawk, on the other hand, is quite a lovely creature; it's a pity that it died. 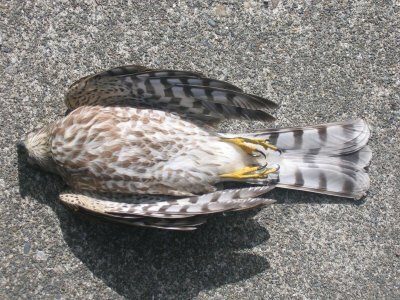 Apparently, it's illegal to possess a migratory bird, and since I don't want to keep the hawk in my freezer until Monday (when the department of Fish and Wildlife opens), I called up my state patrol friend to ask him what I should do with the birds. He said to bury the birds and call it done. So... if anybody from the fish and wildlife comes knocking, I've got my state patrol friend's number. Anyhow, the birds are now in the ground together. So sad. 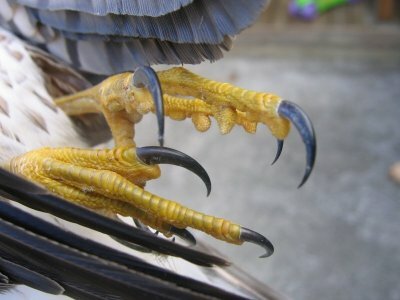 Birds are such beautiful creatures. 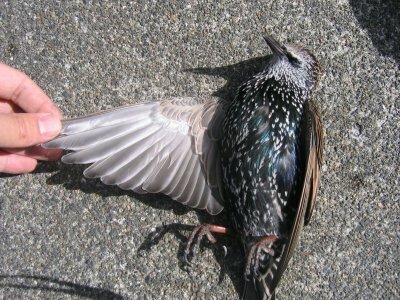 Aww I like birdies also.. it is sad to see animals die because of our living habits and invasion of their used to be natural territory. I am glad that you took the measures to mkake sure to do the right thing legally before taking any action and that you gave them a proper burial instead of just throwing them in the trash can. Sad. I like birds a lot, too. Glad you got a chance to look at them closely. 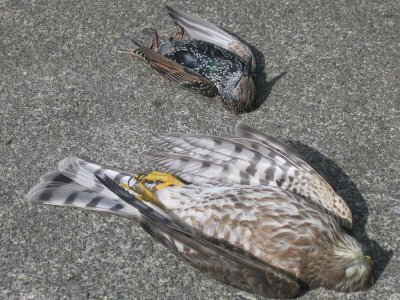 atleast the hawk took the starling with it.... nasty little bastards starlings are.... shame bowt the hawk though. 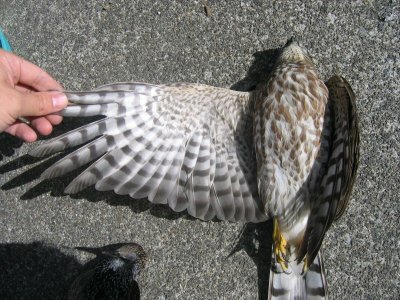 I lost a red cardinal that i watched hatch and fledge in my yard to a window crash.